September 2018 — Congratulations to Varsha Rallpalli on being awarded the ASHA New Investigator Grant! Alexander Johnson, who worked in the lab as an undergraduate, begins his PhD in engineering (with a focus on DSP) at UCLA. Welcome to the new academic year. August 2018 — We welcome a new research assistant, Pat Zacher, who is completing a postbac program with the goal of a PhD in cognitive neuroscience. Varsha presents two posters at the International Hearing Aid Conference. One of our lab graduates, Eric Hoover, begins his new position as Assistant Professor at University of Maryland. And we all begin to think of fall, and a new year with new projects. June 2018 — Congratulations to Dr. Jing Shen on her appointment as an Assistant Professor at the University of Western Michigan! Congratulations also go to Paul Reinhart on his new position as a researcher at the Naval Submarine Medical Research Laboratory, and to Greg Ellis on receiving his PhD from the University of Louisville! We welcome five new lab members this summer: Greg Ellis joins us as a new postdoctoral research associate with interests in reverberation and spatial hearing; Kendra Marks as a study coordinator and lab manager; and Katherine Marcus, Adelia Witt, and Sarah Whittaker will begin work on the AuD capstone projects. Finally, congratulations to Alexander Johnson on receiving the 2018 Harold B. Gotaas Undergraduate Research Award (for his work in the lab) from Northwestern’s McCormick School of Engineering. February 2018–Congratulations to Dorina and her family on the birth of twin boys! Welcome Alexander and Daniel. September 2018–We welcome new lab members Andrew Burleson (Northwestern’s first official PhD-AuD student!) and Rebecca Welles. Some of our events in 2017–Paul Reinhart defends his dissertation work, entitled “The Interaction between Reverberation and Hearing Aid Processing for Speech Perception in Noise”. Rachel Ellinger is awarded an ASHA Students Preparing for Academic Research Careers award – congratulations Rachel! Pam makes a short trip to London, where she is involved in a hearing aid grant to develop speech enhancement techniques that use binaural processing. Some of our events in 2016–With our collaborators Erick Gallun, Richard Wright, Pavel Zahorik and Jim Kates, we are awarded a 5-year grant from NIH to continue our work in understanding how advanced signal processing algorithms interact with an impaired auditory system. Dr. Tim Schoof (with her colleagues Axelle Calcus & Barbara Shinn-Cunningham) organizes and hosts the 2nd edition of the Frequency Following Response Workshop in Boston, MA. Paul Reinhart is awarded a predoctoral fellowship, “Individual Differences with WDRC Amplification in Challenging Environments” from the National Institutes of Deafness and Communication Disorders to support his dissertation research. Congratulations Paul! Some of our events in 2015: Paul Reinhart is awarded the American Academy of Audiology Student Investigator Hearing Aid grant. Jing Shen welcomes a new family member when Brandon joins big brother Adrian. 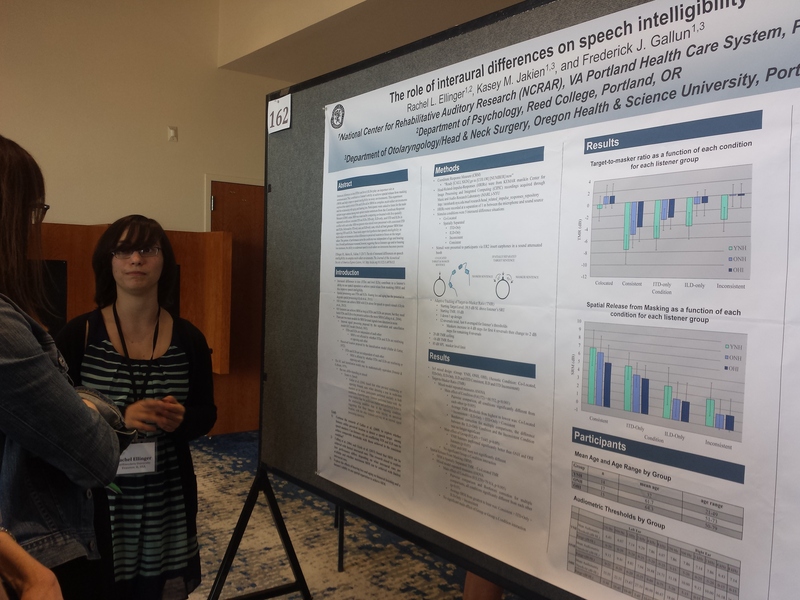 She also begins work on her NIH postdoctoral award, studying the role of pitch perception in older listeners communicating in multitalker environments. Some of our events in 2014: Eric Hoover completes his PhD and begins a postdoctoral position in the Auditory & Speech Science Laboratory at the University of South Florida. Paul Reinhart receives the 2014 Student Research Grant in Audiology from the American Speech-Language-Hearing Foundation. Barbara Ohlenforst completes her master’s thesis and begins her PhD studies at the VU University Medical Centre in Amsterdam.